Kristina Grabarz's footwear stays on infants so they can explore the world without losing clothing. 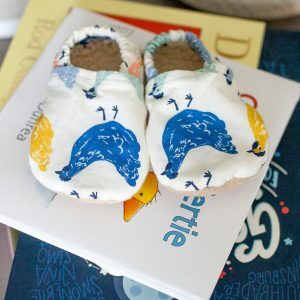 When Kristina Grabarz’s oldest son was a baby, she had trouble finding socks and baby booties that would fit his chunky feet. The booties may be worn with or without socks, and they are machine washable. So Grabarz, a biologist who used to work in research and development at Idexx Laboratories, took matters into her own hands, literally, and created a bootie pattern specifically for her son’s feet. After a few tweaks, she had something she thought other mothers might like as well. Now she has her own company, Two Little Beans & Co., that sells not only the booties but bibs, leggings, dresses and headbands. The Two Little Beans booties have a warm sherpa lining, and the outer sole is made of waterproof, non-slip faux suede for exploring the driveway or lawn. “The soft soles are important for foot development when the babies are starting to cruise and walk,” Grabarz said. The booties also have elastic around the ankle that makes them easy to get on a wiggly baby, but tight enough to stay on. They can be worn with or without socks, and they are machine washable. 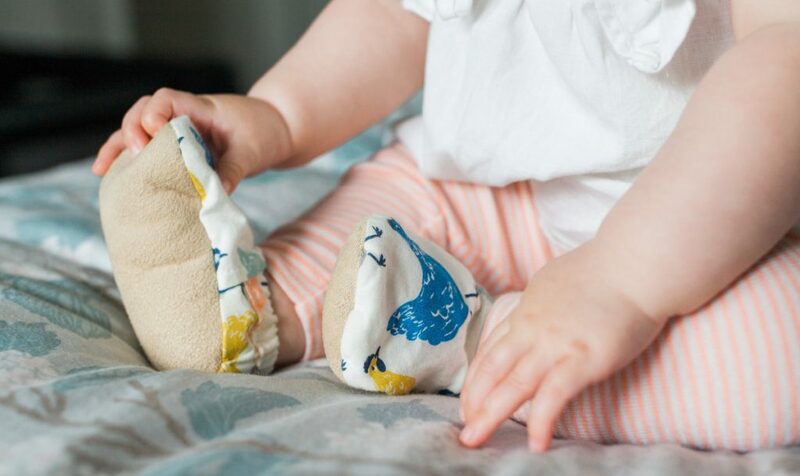 The booties are made from eco-friendly, 100 percent organic cotton, and Grabarz – a Portland resident who grew up here – looks for patterns that will appeal to Mainers and former Mainers, who make up much of her customer base. There are lobsters, of course, but she’s also chosen nautical prints, for example, and red plaid for the children of hunters. For University of Maine graduates, there are booties with black bears all over them. Raise backyard chickens? Grabarz has chicken booties for your baby. And the Casco Baby booties feature nautical charts of Casco Bay. Most of the booties cost $25 a pair (the Casco Baby booties are $28) and are available through the Two Little Beans website, twolittlebeansco.com. More than a dozen stores around the country also carry them, and locally, they can be found at Lisa-Marie’s Made in Maine stores in Portland and Bath, at Daytrip Jr. in Kennebunkport, and at Carroll Drugstore in Southwest Harbor.